The Neumann U47 is a large-diaphragm condenser microphone manufactured by Georg Neumann GmbH during the years 1949-1965. The U47 used the M7 capsule originally developed for the CMV 3 microphone ("Neumann bottle"). Its PVC membranes unfortunately tended to dry out with age, however, and in 1960 the M7 was superseded by the K49, a capsule with similar acoustical design but membranes made of age-resistant biaxially oriented PET film. The U 47's circuitry was based on the Telefunken VF 14 M vacuum tube (a specially-selected VF 14; the VF 14 was an RF pentode for various functions in military field radios; the discontinuation of the U 47 was caused primarily by the decision by Telefunken to halt production of the VF 14. In some ways the functional successor to the U 47 was the U 67. 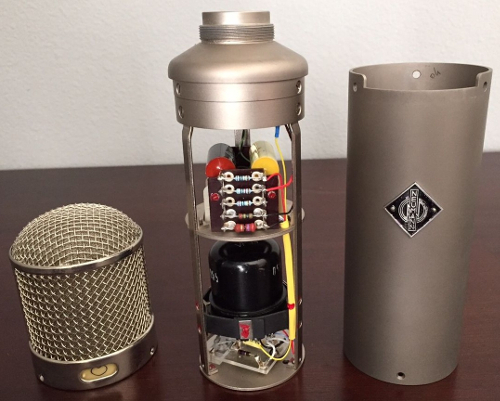 Custom tubes equivalent to the VF14 have been manufactured specifically for the U 47, by Telefunken and others. Beginning in 1962, Neumann offered a fully functional Nuvistor, small signal receiving tube replacement kit for the VF14 and required minor circuit modification. The U 47 is well known for its clear sound, with a distinct emphasis in its upper-midrange frequency response. It has been used in countless famous recordings. The Beatles' producer George Martin used the U 47 extensively in the group's recordings and claimed it was his favorite microphone. The U 48 was identical to the U 47 except for the available polar pattern combinations (cardioid and figure of eight instead of cardioid and omnidirectional). According to Neumann: The Microphone Company. 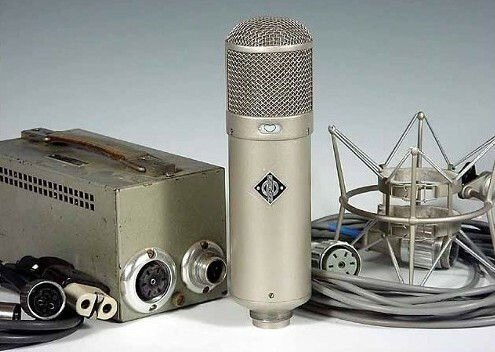 by Anselm Roessler, the U 48 was not introduced by Neumann until 1957. However, according to representatives at Georg Neumann GmbH, examples of the U48 existed as early as 1950. The U 47 fet, a solid-state microphone with yet a third capsule, the K 47, had a headgrille identical to that of the original U 47 but with solid-state circuitry; it was produced by Neumann during the years 1969-1986. It was intended to recapture the sound of the original U 47, but enjoyed only limited success. However, the U 47fet became well known among recording engineers as a bass drum microphone. The U47fet also gained great popularity among double-bass players in the jazz world. Do you have content, to add, about the Neumann U47 Microphone or associated topics? Please feel free to Share it, here!